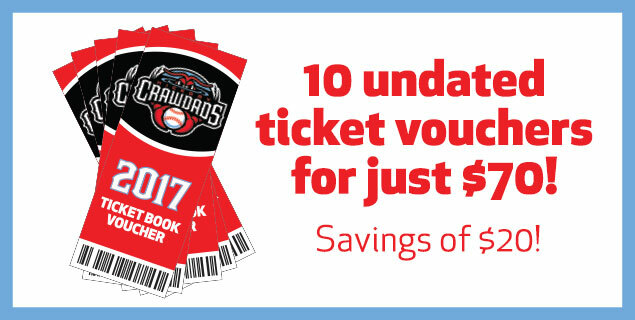 Crawdads Ticket Books contain 10 undated tickets that can be used in any quantity at any Crawdads home game during the 2017 season. You can go by yourself to 10 different games, or spend them all at once and bring 10 of your favorite friends/relatives to one game! Ticket Books are one of the most flexible and valuable ticket options available at just $70, a $20 savings off the regular ticket price! For more information or to order your 2017 Ticket Book, visit L.P. Frans Stadium Stadium or call the Front Office at (828) 322-3000.